There’s a pest in the garden and he’s eating all the vegetables! But Duck has a plan to save the day (well, sort of). Featuring Jan Thomas’s wonderfully wacky humor, rowdy repetitions, and hilarious characters, this book is sure to have young readers laughing out loud! 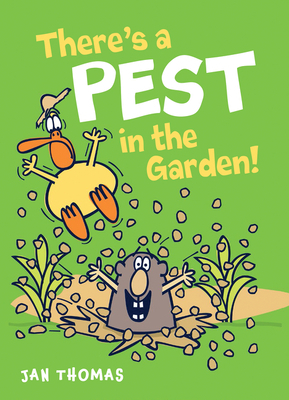 JAN THOMAS is the creator of many hilarious books for young readers. When she isn't working on children's books, she's painting pictures, playing the drums, backpacking, or wrangling dust bunnies. "Silly reads for new readers to dig into."